Training camp is over. The preseason is not. However, there isn’t much time left before the cuts are made. There are numerous darkhorses to make this team among the draft picks and undrafted free agents. Plus, there are numerous position battles still waging as the Bills come back to Orchard Park. To start there is the quarterback battle. Trent Edwards has a firm grip on the starting role Yet, Brian Brohm showed serious poise in his extended audition against Indy and he is likely to enter the season as the backup to Edwards. A couple shaky starts or an injury puts Brohm with the first teamers. Expect Ryan Fitzpatrick to be released so the Bills don’t risk exposing Levi Brown to waivers. The plague of injuries at running back may have opened the door for undrafted free agent Joique Bell to make the 53-man roster. He won’t get many carries but he will surely be a special teams contributor. 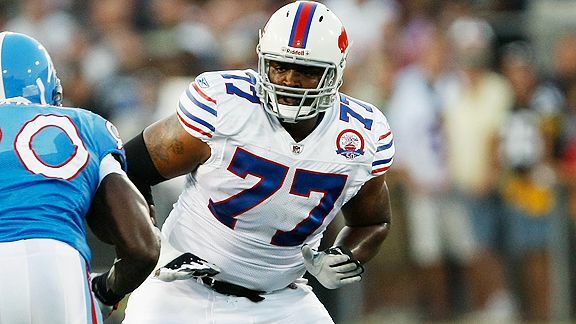 Demetrius Bell could make or break the Bills offensive line and offense in 2010. The offensive line won’t be much different from last season. The interior starters are solid and hopefully Demetrius Bell and Cornell Green can do enough to give Edwards the time to distribute the ball other places than the flat. Shawn Nelson’s injury plus, his ankle injury has seriously hurt his chances to get on the field. He will certainly be on the final roster along with Jonathon Stupar and Derek Schoman (despite his injury). We will see if Michael Matthews will be healthy for this season. Either way, the tight end position doesn’t seem to be shaping up to be a serious threat offensively. Perhaps after week five when Nelson returns there will be a downfield threat. Wide receiver seems to be an interesting race after you get past Lee Evans. James Hardy and Steve Johnson were to duke it out for the second wide out position. But, Hardy got hurt and Johnson has been solid, likely cementing his spot opposite Evans. Roscoe Parrish will make the team, hopefully his punt return skills remain. how Parrish figures into the offense is another question. Chad Jackson and David Nelson are going to make the team. Even with Nelson’s injury, the University of Florida product has been more than impressive throughout camp. Expect to see him on Sundays. Considering his size he might see time outside of kick coverage. On the defensive side I have some doubts. The defensive backfield remains the strength of the team. The only possible race is between Ledois McKelvin and Drayton Florence to start opposite Terrence McGee. Either offers the Bills a formidable corner. I am a McKelvin fan but Florence is a sold, reliable veteran expect him to remain as the starter. You wouldn’t imagine the trouble I went through to find a pic of him in uniform. Will he see the feild more this season. Andra Davis and Reggie Torbor have been revelations at linebacker as offseason free agent signings. Torbor is hurt at the moment but hopefully he will return for the season opener. Chris Kelsay will lock down the strong-side OLB role while Paul Posluzny will remain the rock in the middle. Kawika Mitchell, Chris Ellis and Aaron Maybin will all get their licks. Although Ellis and Maybin do not excite me in terms of talent. Antonio Coleman translates well to the 3-4 scheme and Donovan Woods has a nose for the ball. Both darkhorses have the potential to be special teams aces. As for the d-line there is little to worry about. However, there isn’t too much to be excited about. The only reason I say that is these guys won’t get too much recognition as they toil in the trenches. Marcus Stroud, Kyle Williams, Spencer Johnson, Terrell Troup and Alex Carrington are all strong down linemen. John McCargo has yet to blossom for the Bills, we will see if the 3-4 scheme aids the former first-rounder. The Bills special teams are unlikely to change. Despite the new coach, I don’t expect to see too much of a change. They have great kickers and some scary fast return men. I like the idea of winning the field position battle this year. I still don’t have ultra-high expectations for this season. I think five wins is likely, seven or eight is a success. Of course, three or four wouldn’t be surprising. We will talk at the end of the preseason. I will evaluate the final roster when it is made, then there might be a better picture painted of what this team can do in 2010.